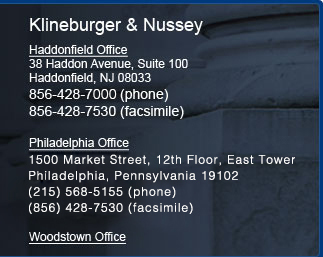 The attorneys of the law firm of Klineburger & Nussey have extensive trial experience, keen logical minds, and a well-earned reputation for upholding the highest standards of the law. From law offices in Haddonfield, New Jersey, and Philadelphia, Pennsylvania, our lawyers counsel clients in the practice areas of criminal defense, family law, and civil litigation. Richard F. Klineburger III is a certified criminal trial attorney, and D. Ryan Nussey is a certified matrimonial law attorney. You may rest assured that we will leave no stone unturned in resolving your legal situation. Contact us to schedule an initial consultation. Please click on the links below to learn more about the professional backgrounds of our attorneys. Regardless of your felony or misdemeanor charges, you have rights that need to be fully protected. Our accomplished criminal defense lawyers have set legal precedent in DWI law and have extensive experience in all areas of criminal defense from traffic violations to murder cases. We handle family law proceedings involving divorce, child custody, child support, alimony, modifications/enforcements, and adoptions with compassion and sensitivity to your personal needs. We are adept at resolving complex civil litigation cases involving business and contract disputes, serious personal injuries, wrongful death, defamation, real estate disputes, and legal malpractice. Copyright © 2010 by Klineburger & Nussey. All rights reserved.